The Infertility Overachievers: PAID...In Cash!! 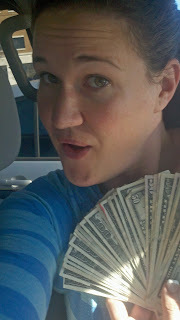 Today I paid, in cash, for my IVF cycle. As excited as I am about my next cycle and potentially having another baby by this time next year, it was so hard to part with all that money. This is the very first picture of my future child. (February 26th, so you better start shopping NOW)!!! How am I going to handle London and being pregnant? Hell, how I am I going to handle London and a new baby? Tonight, none of that matters. Yay! How exciting for you! It's amazing you paid cash for this, way to go! WWOOOOOO!!!! Come on Baby #2!!!! Good luck!! You must be so excited! I hope you get lucky and get a baby with your only try!! I'm crossing my fingers and toes for you!!! && saying a couple prayers!! Remember how I told you I love you triple the other night....well for a brief second I thought about replying and saying let's go triplets...then I thought about how your blog site name may change to AAA for the Infertility Overachiever! It's all simple...I will take London and you can have the new baby/babies! Love you and where can I get my husband one of those cash makin' businesses? Yay! I hope everything goes well for you!! YAY! I am so excited for you and your family. Yay!! congrats. I am in my first and only IVF cycle now. Start my injections on Thursday. I have been a follower for awhile and I am excited to read your blog as we both go through this journey. I'm so excited for you! Good luck! So excited for you guys! We miss seeing you around! Good luck!!! You made such a pretty layout! LOL. Here we go, time to make London a brother or sister :) So excited! How exciting! I'm getting ready for a FET for baby #2. C'mon REs, get us pregnant!! So excited for you and the fam, I'll keep my fingers and toes crossed for you!! HOORAY!!!! You're on your way!!!! I'm so excited for you!!!!! Yay for paying in cash!!! and wow that's a LOT of medicine!!! Whoo hooo!!! How exciting! Keeping my fingers crossed #2 is on his/her way! Well we'll have something in common... I just did my first IVF, got pregnant, and my 30th birthday is Jan. 10! We both get very memorable bdays! wow cash?! Way to go, girl!! Good luck with this cycle. I hope it's a fabulous one for you. Woooo. Nothing says "Happy Birthday" like a BFP (and maybe a little morning sickness....). Hey Aly it's Kimmie from New Years! I finally started a blog! Good luck on Baby #2 that looks like some pretty intense meds there!